The spying accusations against the National Security Agency just keep on coming. Today’s disclosure — that the NSA has actively broken into the links between Yahoo and Google’s data centers — is a big one. 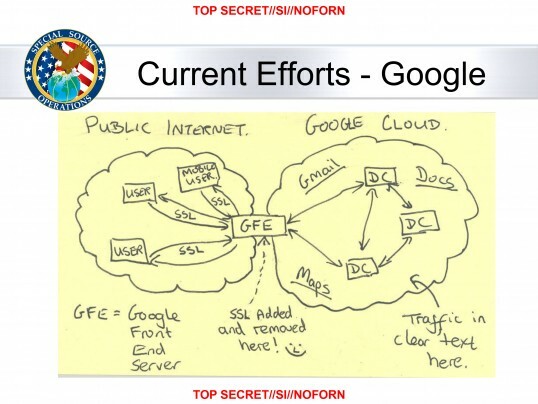 The Washington Post reported that the NSA has shown slides of the agency decrypting traffic between data centers belonging to Google and Yahoo. The program, known as MUSCULAR, is designed to grab traffic flowing between the data centers operated by the two web giants and select which bits of traffic it wants to keep. Because that traffic can include current files as well as backups and corporate documents, it’s both incredibly sensitive to those companies and their users and helps the NSA gain access to a more complete history of a targeted suspect. Regardless of the NSA’s justification neither Google nor Yahoo are pleased with the disclosure. Both gave statements to the paper saying they were unaware of the practice, and the story recounts two Google engineers bursting into profanity when they saw the slide pictured above and learned of the practice. The White House and the Office of the Director of National Intelligence, which oversees the NSA, apparently declined to confirm, deny or explain why the agency infiltrates Google and Yahoo networks overseas. so, do YOU trust silicon valley?